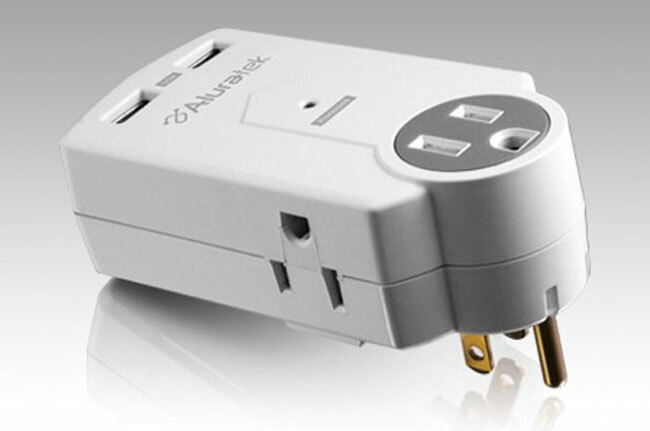 Aluratek has a cool new surge protector that will fit into your outlet and won’t block the outlet below it. The device is made to protect your hardware and gadgets from surges and it will allow you to directly connect some of the USB charging gear using the factory cables rather than having to plug in a USB adapter. The surge protector is called the AUCS05F Mini Surge Dual USB Charging Station. The device hangs from the outlet rather than having a cord and a rectangular surge strip like most protectors on the market. There is one three-prong AC outlet on the front and then one more on each side for a total of three outlets. At the top of the surge protector is a pair of USB ports that will charge all sort of USB gadgets. It’s not clear if those ports will charge the iPad thought since it needs more than some USB outlets can provide. The adapter is available right now for $19.99.